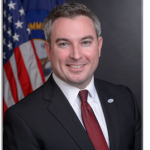 KY agriculture commissioner Ryan Quarles will be visiting Paducah today. Quarles will be touring the Kight’s Pecan Orchard at 9270 Old Hinkleville Road in West Paducah at 1:30pm. Quarles will also be in Ledbetter at 11:30am to speak at the Livingston County Livestock Auction at 1636 US 60 Ledbetter. Both events are part of the Kentucky Hunger Initiative he launched earlier this year. The Hunger Initiative is a first-of-its-kind effort in Kentucky to bring together farmers, charitable organizations, faith groups, community leaders, and government entities to begin a dialogue to help reduce hunger in Kentucky.